Two men who helped shape British dance music history will share their work and experiences at a keynote event in Wrexham’s newest town centre venue. 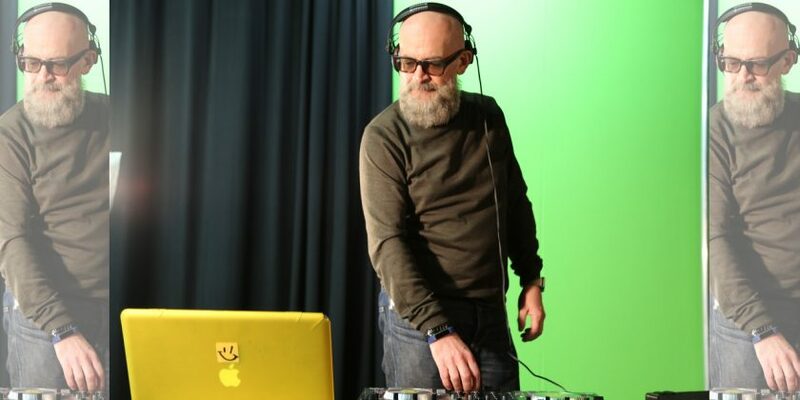 Wrexham Glyndŵr University lecturer – and Haçienda legend – Graeme Park will be In Conversation with artist, DJ and producer Gerald Simpson – better known as A Guy Called Gerald – in Tŷ Pawb as part of the Focus Wales festival. The session, on Friday 11 at 3.30pm, will focus on Gerald’s contribution to dance music culture – and may well include the night where one of his best known tracks was first aired to the Haçienda crowd. Graeme recalls: “I was in the DJ booth one night back in 1988, and there was a knock on the door. “That record was Voodoo Ray, and when I heard it I knew it was something special – I hammered it and played it for weeks and weeks after that first meeting. “Up until Voodoo Ray came out, the house scene was effectively an American led think, with records from Detroit and Chicago. There had been some British house records, but they were people copying the American sound. From there, Gerald started to build a reputation as a leading producer across a range of styles including house, techno and drum and bass. During their chat, Graeme says he will ask Gerald about his career as a musician and producer – the pair still met up several times a year when they appear at the same events and catch up. They will also be discussing Gerald’s recording techniques and equipment – and their shared history in British dance music. He said: “I had been talking with Focus Wales and looking to do something with them for a few years, and when this came up it was perfect. “I still remember, halfway through 1988 when records from people like Gerald and 808 State were coming out, how Mike Pickering and I realised we were on to something big. We’d gone down to London and they were all soul boys down there at the start of the year. Graeme now uses his musical knowledge as a Senior Lecturer at Wrexham Glyndŵr University, where he teaches a range of courses linked to his career as a DJ, producer and broadcaster. He said: “I teach a module called Creative Futures, where I use my extensive industry contacts to help students get ready for whatever career path they are looking to take after university. That means bringing in singers, sound techs, musicians, journalists, broadcasters – the whole range. More about the School of Creative Arts, where Graeme teaches can be found here. Further information on FOCUS Wales and how you can purchase tickets can be found here.